ST. GEORGE — Prime Minister the Rt. Honorable Dr. Keith Mitchell, Prime Minister responsible for Science and Technology (S&T) in CARICOM has signaled his intentions to strengthen the S&T capacity in the region so that it can, in the shortest possible time, assist with economic and social development. To achieve this objective, the Honorable Prime Minster launched at his Office on January 10, 2014 a CARICOM S&T Committee comprising of some of the region’s well known personalities who have been laboring in the vineyard of S&T for over a decade. 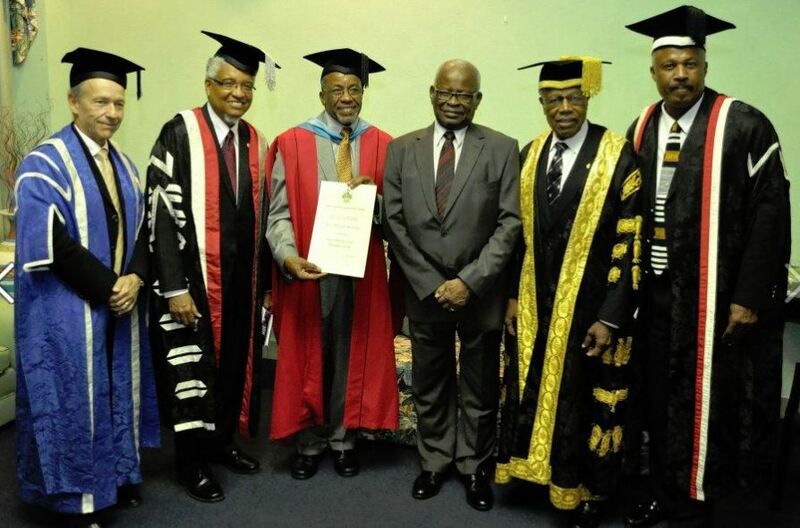 These are Professors Harold Ramkissoon, President Emeritus of CARISCIENCE (Chair), Ishenkumba Kahwa, Deputy Principal of the Mona Campus, UWI, Dr. Arnoldo Ventura, former Advisor to the Prime Minister of Jamaica, Mr. James Husbands, Director of Solar Dynamics and Mr. Kent Mitchell. Representing the Diaspora in this Committee is Professor Cardinal Warde, Professor of Electrical Engineering at the Massachusetts Institute of Technology, USA. 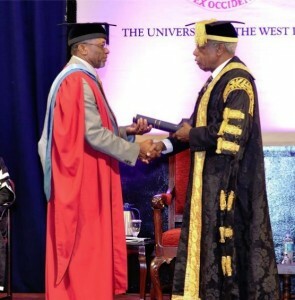 The Committee has been mandated to, inter alia, swiftly promote the development of S&T in CARICOM as a tool for economic development by working closely with all Governments and scientific organizations in the region, and serve as an advisory body to the Prime Minister responsible for S&T in CARICOM. The first meeting of this Committee took place in Grenada on January 10, 2014 at the Prime Minister’s Office. During its 2012 round of graduation ceremonies, the University of the West Indies (UWI) conferred a total of 20 honorary doctorates. 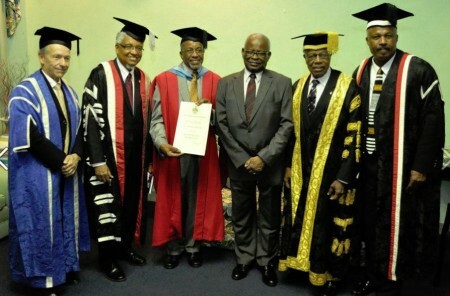 Mr James Husbands was awarded the LLD honorary doctorate at the UWI Cave Hill Campus in Barbados on October 20, 2012. 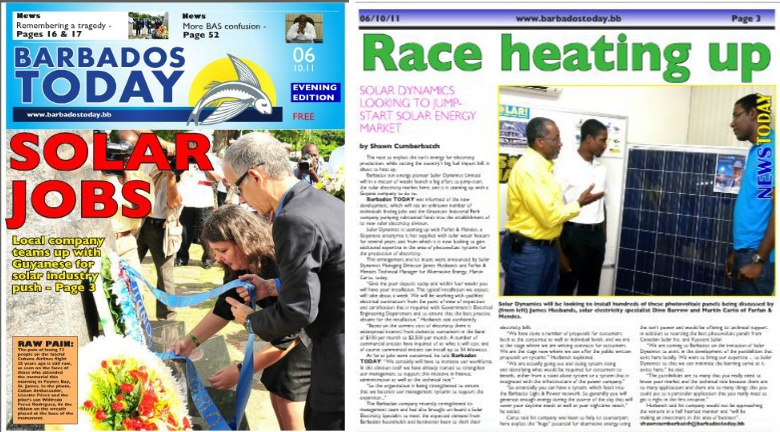 Read the Barbados Today, Oct. 6, 2011 article on Solar Dynamics Ltd’s new solar initiative as seen below. February 2011: Caribbean Awards for Excellence 2008 Science & Technology Laureate, Dr. Husbands delivers the Caribbean Awards Lecture on Sustainable Energy at the UWI, St Augustine campus. James Husbands is “The Featured Personality” in The Caricom Energy News Letter of May 2010. The Barbados government and the Central Bank of Barbados hosted a joint two-day alternative energy conference to educate stakeholders and the public about the benefits of utilizing alternative energy sources. The symposium, under the theme Alternative Energy: Pathway To A Sustainable Future In Barbados, was held September 6-7 September 2010 at the Lloyd Erskine Sandiford Centre. Download presentation on Solar Dynamics given at the Energy Conference.